Opponents of Egypt's ousted Islamist President Mohammed Morsi wave national flags and posters of Gen. Abdel-Fattah el-Sissi in Tahrir Square in Cairo, Egypt, Friday, (Photo: AP). Supporters and opponents of ousted president Mohamed Morsi – removed by the military earlier this week – plan rival demonstrations on Sunday, with the former demanding Morsi's reinstatement and the latter supporting Morsi's overthrow. A coalition supporting Morsi's reinstatement has called for protests on Sunday to reject Wednesday's "military coup" against the elected president by Egyptian Defence Minister Abdel-Fattah El-Sisi. The Muslim Brotherhood-led National Alliance in Support of Legitimacy, a group formed recently to support Morsi, has called for mass rallies to "Protect the revolution." The Egyptian Armed Forces deposed Morsi after millions took to the streets on 30 June to demand early presidential elections. Morsi supporters say the army's move represents a violation of "democratic legitimacy." In an earlier statement, the National Alliance in Support of Legitimacy declared that Morsi was still president and condemned the arrest of several high-profile Muslim Brotherhood members by security forces. Many Egyptians welcomed the military intervention, with many celebrating when Morsi was replaced earlier this week by the head of Egypt's High Constitutional Court (HCC). The military announced a "roadmap" in coordination with opposition parties, whereby presidential and parliamentary elections would be held and the constitution amended. 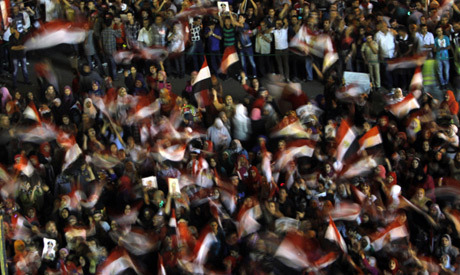 The roadmap fulfilled opposition demands as set down in a petition campaign to oust Morsi signed by millions – the impetus behind the 30 June protests. The 'Rebel' campaign had collected signatures nationwide to impeach Morsi and call for early presidential elections. The campaign had recommended the appointment of the HCC head as interim president and the formation of a new technocratic government to oversee a transitional phase. The Rebel campaign is also calling for Sunday protests, urging Egyptians to defend what they describe as "popular legitimacy" in an attempt to counter what their opponents insist is Morsi's democratic legitimacy. Fears run high as clashes between supporters and opponents of the ousted president in several Egyptian cities on Friday led to at least 36 deaths. Despite Brotherhood leader Mohamed Badie's statement at a massive pro-Morsi rally in Cairo where he stressed the need for peaceful protest, supporters in many of the clashes were seen using weapons, as were their anti-Morsi opponents. Residents of Cairo's middle-class Manial district said Morsi supporters were "heavily armed" and attacked them leaving at least seven dead, AFP reported. Thousands of Manial residents took part in the funeral procession of those killed Friday. The Brotherhood also held a funeral for those killed when Morsi supporters demonstrated Friday outside the headquarters of Egypt's presidential guard, believing Morsi was being held inside. They blame the military for killing several protesters. All those who betrayed first democratically elected President Mohammed Morsi with the help of their foreign masters will go to dustbin of history one day. ElBaradei a stooge of western powers betrayed his first mentor Mubarak will betray traitor Sisi too. Muslim Brotherhood the strongest & most organized political force in Egypt will be able to withstand this blow. Nasser, Sadat, Mubarak - all tried in vain to suppress Muslim Brotherhood. Egyptian people once again will reject all conspiracies against Islam. Now that blood of people is flowing in the streets, we have to find solution of the crises. 30 people killed in the last few days and more than a thousand wounded. So what is next? How can Egypt go out of the crises. Here are some suggestions 1. Re-instate President Morsi President Morsi has to be re-instated as he was first elected President of Egypt. He is constitutionally and legally President. Never Presidents go with the demonstrations of the people. If this is the case then there is no need of elections, only demonstrations are enough to be a leader of state. The Chief Justice of Supreme court is unconstitutional President with no votes. He has no weight in international politics. Has this ever happened in the democratic west? His being President will further deteriorate the crises in Egypt. We have seen in the world leaders have come back to their positions. Nawaz Sharif, the current Prime Minister of Pakistan, was re-instated as Prime Minister by Supreme Court in 1990s.Gorbachiof was re-instated as President of Russia and so on. 2. Departure of Mr. Al-Sisi from his position Mr. Al-Sisi, the Defence Minister goes back to his position where he was a year ago and completes his services there. He is replaced by a new Defence Minister. Army maintains its promise to be away from politics. All political leaders arrested in the last week be releaseds. 3. Formation of a new coalition Government A new coalition government has to be formed where all political parties are inclusive. The representative of youth and other opposition parties have to take positions as competent ministers in the new coalition government. The ministers have not only be politicians, they have to be experts in their field. They have to be competent economists, educationists etc. 4. Formation of Economic Committee An economic committee of expert economists has to be formed who will review the economic situation of the country. The committee has to see the economic problems of the people and suggest solutions to the economic Minister and to the President. 5. Security Committee Another committee of experts has to be formed who will review security situation in the country. In view of the current situation, it is important that the security of all areas, people is thoroughly examined and reported to interior Minister and President and proper actions are taken to protect people. This is the only way to save Egypt.